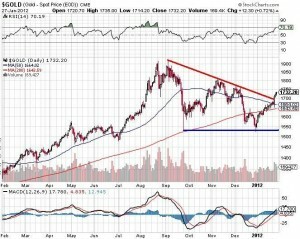 Finally, a decent week for gold. Sweet. 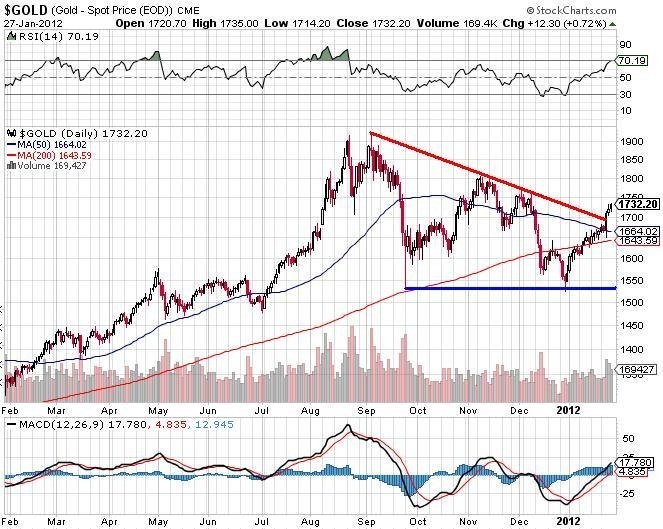 Gold peaked at just over $1,900 at the end of the summer, and then “crashed” to under $1,550 in late September, and then again in late December. The month of January has been a golden month, with gold now at $1,732, an increase of around 12% since the lows at the end of 2011. 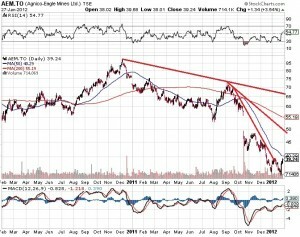 Not exactly the greatest looking chart, considering it’s a blue chip gold stock. 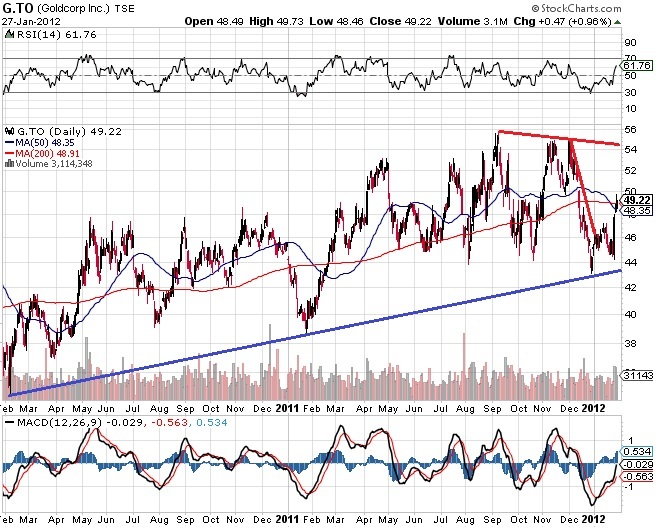 Fortunately the collapse has ended, but there’s a lot of overhead resistance before this one will look good. 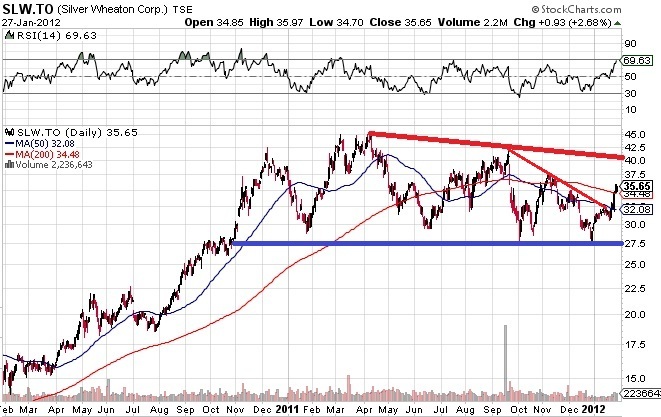 This is a stock that is very close to all time highs, so again, this would be a candidate for over-weighting. 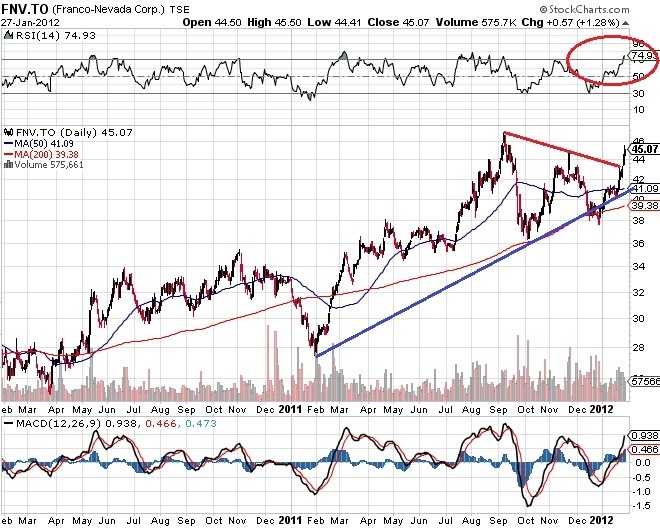 (As an aside, back in July I wrote a post on Franco-Nevada Corp – Time to Buy?, and I concluded that yes, it was time to buy, and I did, and I’m quite happy with that decision, thank you very much). 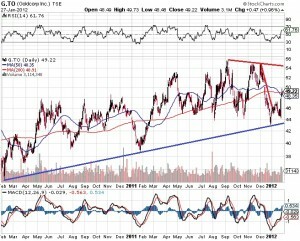 There is obvious support at $27.50, and new highs in the near future would not surprise me. I’m holding. 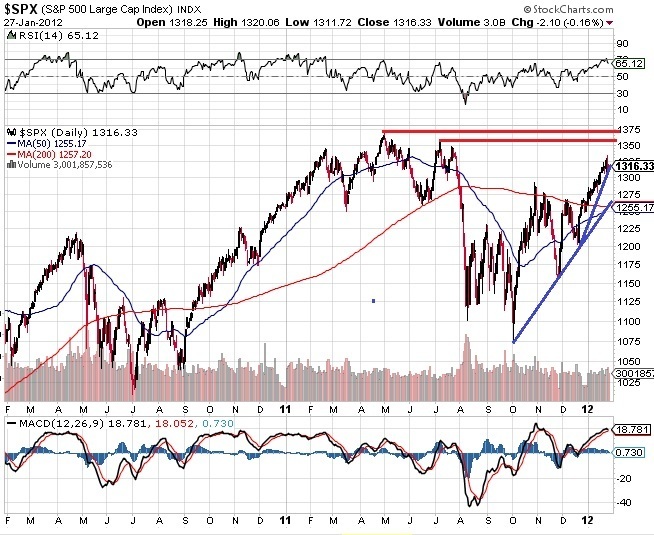 First, the Relative Strength Index on all of these stocks is getting “toppy”; anything over 70 is a warning sign, so we may be approaching a short term top. 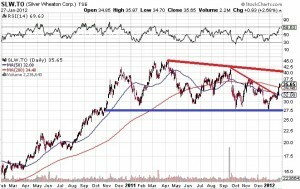 My portfolio is up 12% this month, which is obviously not sustainable over the long term, so taking a few dollars off the table now to lock in profits would be prudent. I’m currently 30% in cash, and I’ll probably increase that to 40% or more this week. 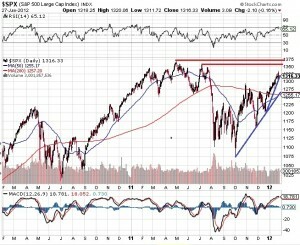 So, since I predicted the top, the market has advanced 1 point. I guess that makes my prediction wrong, but that’s fine, I’m sticking with it. 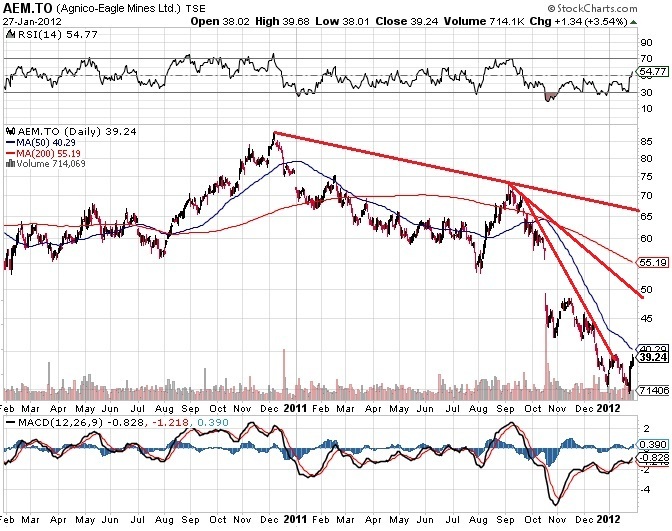 To summarize: I will drastically reduce my holdings in the under performers this week (like AEM.TO – Agnico-Eagle Mines Ltd.) in anticipation of short term weakness and to lock in profits, and then I will place stink bids to increase my holdings in the better performers on any weakness. All comments welcome; feel free to agree or disagree; see you next week.